On August 29th, our friend Kenny, pictured left, turned 39… again. At your right is another perpetual 39-year old. We decided to give Kenny his own trip around town for his birthday present, and this is the tale of his travels. We’ve driven by the Cutchogue Diner many times, always wanting to try this North Fork landmark. Located, of all places, in Cutchogue, the diner is right on Rt. 25 when heading eastbound. Built in 1941, it looks great, and produces some terrific omelettes. We ordered a Kielbasa, Italian, and Chili-Cheese, and tasted them all around. We know they were made to order, as we could hear the chef at work in the kitchen. Local ingredients included North Fork eggs and Kielbasa from Riverhead. I neglected to ask about the origin of the potatoes, with which the chef made excellent home fries. Readers of this blog may have guessed that I ordered the Kielbasa. Now full, and fueled by some good diner coffee, we felt ready to go on for some wine tasting. We were soon at Pugliese Vineyards. Marian and I were long overdue for a visit to Pugliese and we were pleased with what we found. Better yet, so was birthday boy Kenny. After all, we are talking about his trip around town. Dominica Pugliese, pictured left, gave us an excellent tasting of five Pugliese whites. We’ll review the full flight in another post, but will offer one review now. 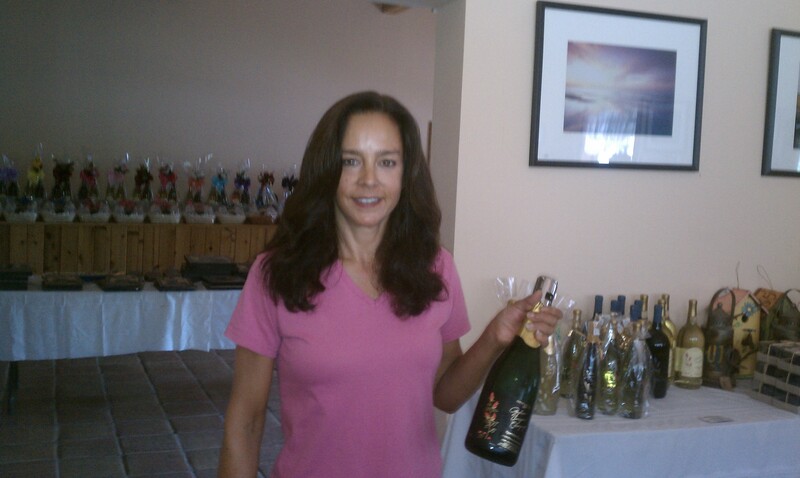 We all loved the 2003 Blanc de Noir Sparkling wine. Straw to salmon colored, with a caramel nose, this sparkler is “no dosage” dry. Enjoy this one with some raw bar before you grill your steak. At $22.99 a bottle, it is as affordable as it is delicious. By the way, the Pugliese Vineyards site is beautiful. In the picnic mood? This would be a wonderful place to stop and enjoy some wine with your picnic lunch. Some folks in your party don’t like wine? Pugliese is ready for them too. Your beer drinker will enjoy some of Southampton Public House’s finest brews. 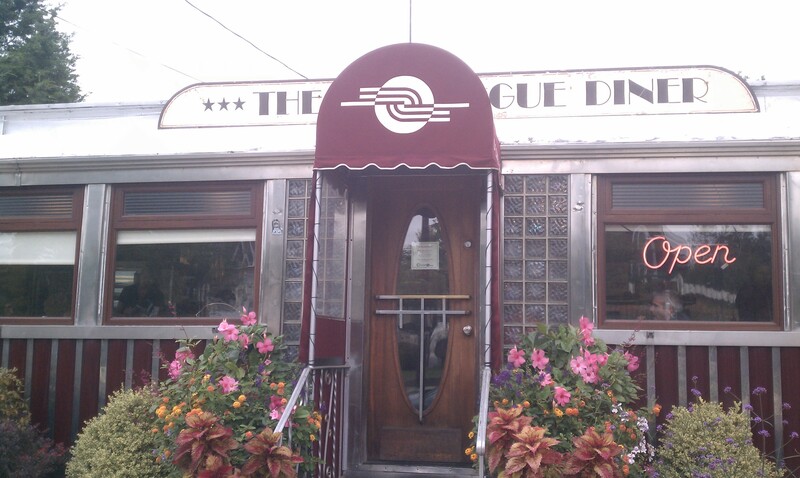 From every angle, Pugliese is a great place to stop on your trip around town. Continuing west from Pugliese Vineyards, we zeroed in on McCall Vineyards. 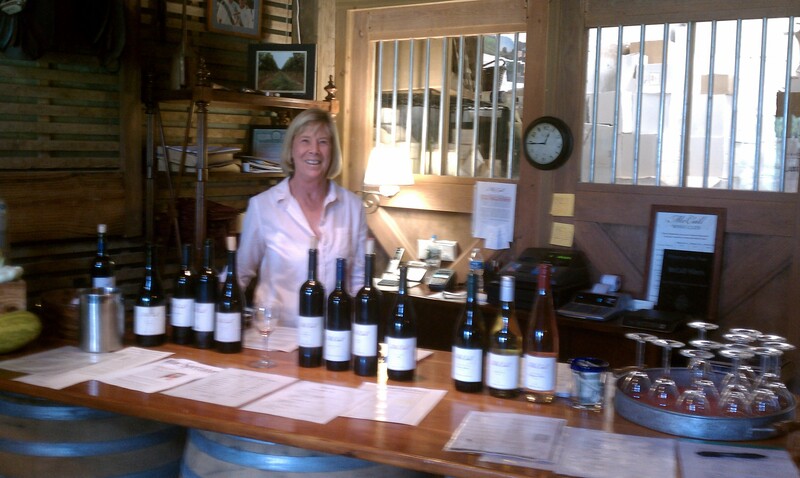 We frequently visit McCall, as we love the wines, and enjoy our conversations with Nicola and Russell McCall. The tasting room is a refurbished barn. 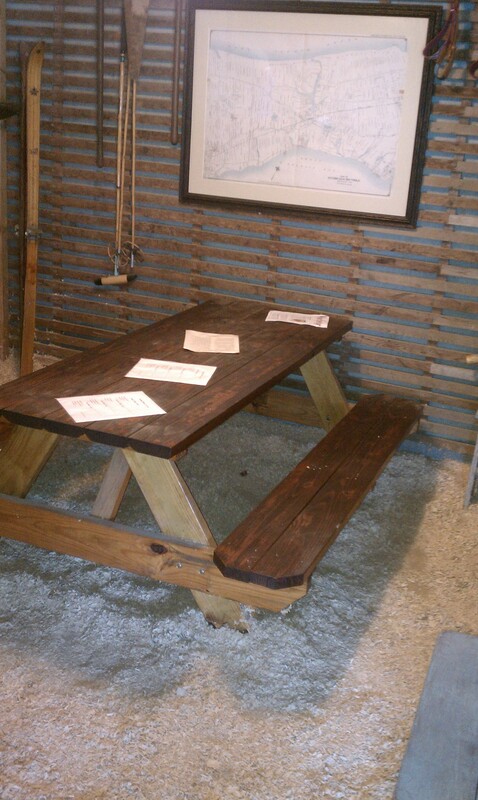 You and your tasting crew can sit in one of the stalls and relax with your wine. In this year’s New York State Wine and Food Classic, McCall was named Winery of the Year. Their 2010 pinot noir reserve, Corchaug Estate, was voted best pinot, and their 2007 Ben’s Blend red wine took a double gold. Naturally, Kenny wanted to taste the winners, and Nicola McCall had the flight all ready to go. These are amazing wines. We tasted the winning pinot, its 2010 pinot non-reserve sibling, Ben’s Blend, and the 2007 Merlot. We’ll give you a full review of the flight in a future post. However, fabulous as the pinots and Ben’s Blend were, we all fell in love with the Merlot. It is also the bargain of the lot, at $30.00 a bottle. Note that McCall Winery is a very friendly place that invites a picnic. Try their Rose with your picnic lunch. 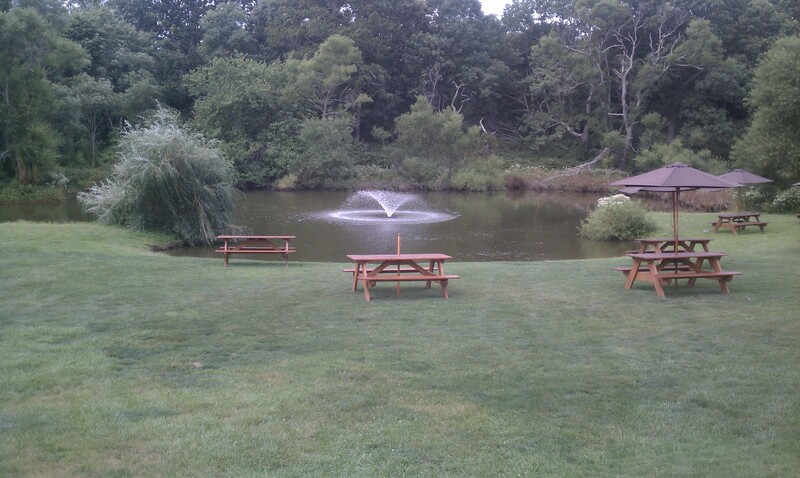 After McCalls, we were done with wine tasting for the day, but not with the North Fork. A quick stop at Junda’s Pastry Crust & Crumbs in Jamesport and we had Kenny’s dessert. A super raspberry – peach strudel for later. We continued west on Rt. 25 into Aquebogue, where we stopped at Goodale Farms. Goodale has great dairy products from their herds of goats and cows, but this time we simply wanted to see some baby goats. We learned that the babies we visited in springtime had grown considerably. 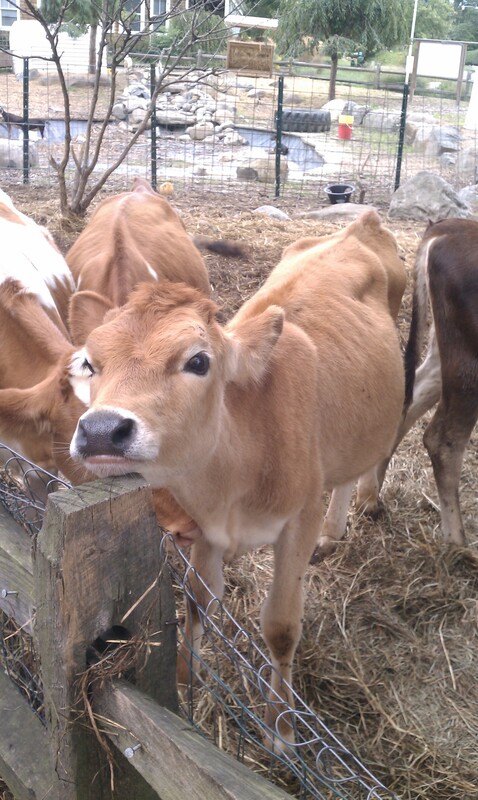 Meanwhile, we visited with a few friendly calves, one of which you can see right here. Kenny wanted to take the calf home, but birthday or not, it was out of the question. Before heading home, we decided to find Riverhead’s Polish Town. A small enclave of Polish shops and the Polish Hall, this is a piece of our East End past that stands in contrast to the homogenized malls and look-alike towns that cover the western part of Long Island. We visited a deli and purchased some Polish beer to try, and we will report on this in a future post. Tired yet? At this point we were, and we were also ready for dinner. Notice that I never mentioned lunch. That is because our Cutchogue Diner breakfast and some tastes of good wine held us all day. Kenny’s birthday dinner was a Vietnamese-style marinated flank steak, served with a Thai-style grilled eggplant salad and some steamed rice. Two pounds of flank steak was demolished in short order. We served an Oreana Winery “mystery red”, which worked wonderfully with the spicy meal. Yes, we also made Junda’s strudel disappear. Kenny’s trip around town had finally drawn to an end. 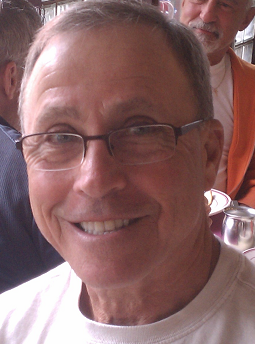 Kenny, we hope you had a great time. I know that we did. Laurel Lakes Vineyard, Coffeepot Cellars, Lambborguesa, and more detailed Pugliese Vineyards and McCall Vineyards reviews. Stay tuned, and enjoy your trip around town.